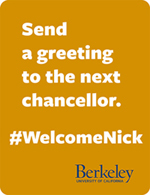 Upon winning formal confirmation from the UC Board of Regents on Tuesday as Berkeley’s 10th chancellor, Nicholas Dirks affirmed his own commitment to the university’s public mission, and to what he called a shared responsibility to be both “excellent and accountable” to California taxpayers. 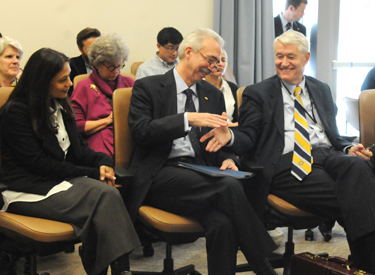 Dirks, Columbia University’s executive vice president and dean of its faculty of arts and sciences, spent most of the morning at the Office of the President’s Oakland headquarters, appearing before a group of regents that included Gov. Jerry Brown and Lt. Gov. Gavin Newsom. The board — some of whom participated in the meeting via conference call — unanimously approved his appointment. He also admitted to being “more than a little daunted by the kind of challenges that lie ahead,” particularly the “substantial disinvestment” in UC and higher education generally by the state of California, a challenge the governor said he was committed to addressing. Brown was joined by Newsom and regent Charlene Zettel in voting not to approve a base salary of $486,000 for the incoming chancellor, $50,000 of which will be paid by private donors. The portion funded by the state and other sources, $436,000, is the same as Birgeneau’s annual salary, and less than Dirks’ current salary at Columbia. Before going to Columbia to chair and rebuild the Department of Anthropology in 1997, Dirks taught history and anthropology at the University of Michigan, where he co-founded the interdepartmental Ph.D. program in anthropology and history and directed the Center for South and Southeast Asian Studies. He taught Asian history at the California Institute of Technology for nine years before moving to Michigan. He and Bakhle have a 13-year-old son. Bakhle will be considered for an appointment at Berkeley, which, if approved, would also begin in June. 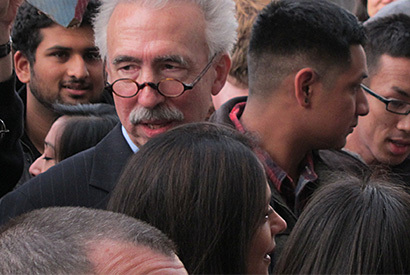 Formalities over, Dirks and Bakhle visited the Berkeley campus for a a private reception in the Morrison Library, followed by a public celebration outside the library, where hundreds of students, staff and faculty gathered to get their first glimpse of the next chancellor. 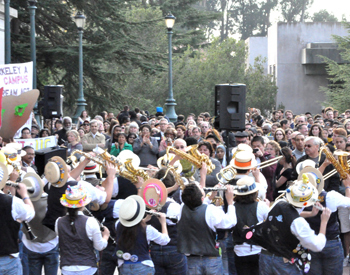 A dozen students in blue-and-gold sweatshirts crowded the front, and the Cal Band lurked out of view, waiting for its chance. A few protest placards were in evidence, but the crowd was quiet and eager to hear from Dirks. “He seems like a cool guy,” she added.